Youthful fantasy romance sageuk “Moonlight Drawn by Clouds” holds press conference before it’s premiere next week and reveals long drama preview. Upcoming youth romance sageuk “Moonlight Drawn by Clouds” released a beautiful official poster and fifth quirky teaser. Upcoming youth romance sageuk drama ‘Moonlight Drawn by Clouds‘ continues to bring excitement for its premiere with 4th teaser. Upcoming KBS Mon-Tues sageuk drama ‘Moonlight Drawn by Clouds‘ revealed beautiful character posters with leads Park Bo Gum, Kim Yoo Jung, Jin Young, Chae Soo Bin and Kwak Dong Yeon. The hazy visual soft lighted posters give off a beautiful vibe of the main leads. Park Bo Gum shows the crown prince unfaltering charisma, while Kim Yoo Jung illustrates Hong Laon’s feminine side. The posters also finally give a glimpse at the second leads: Jin Young as a poised scholar, Chae Soo Bin as gracious royal consort, and Kwak Dong Yeon as the crown prince’s bodyguard and friend. Upcoming sageuk drama ‘Moonlight Drawn By Clouds‘ 3rd teaser forecasts hilarious situations and heart-stopping romance of leads Park Bo Gum and Kim Yoo Jung. Upcoming KBS sageuk romance drama ‘Moonlight Drawn by Clouds‘ released stills with leads Park Bo Gum, Kim Yoo Jung and B1A4‘s Jin Young. Upcoming KBS drama ‘Moonlight Drawn by Clouds‘ teases with the budding romance between main leads Park Bo Gum and Kim Yoo Jung. Upcoming KBS’s youth romance sageuk drama “Moonlight Drawn By Clouds” finalizes cast with Park Bo Gum, Kim Yoo Jung, B1A4‘s Jin Young and Chae Soo Bin. MBC 2015 Drama Awards made many happy, being the first to finally give actor Ji Sung the much deserved Daesang (Grand Prize), for his incredible performance in “Kill Me Heal Me“. His co-stars Hwang Jung Eum and Park Seo Joon were the other big winners of the night, receiving Top Excellence actress, Director’s Award, and Popularity and Excellence actor and Popularity respectfully. 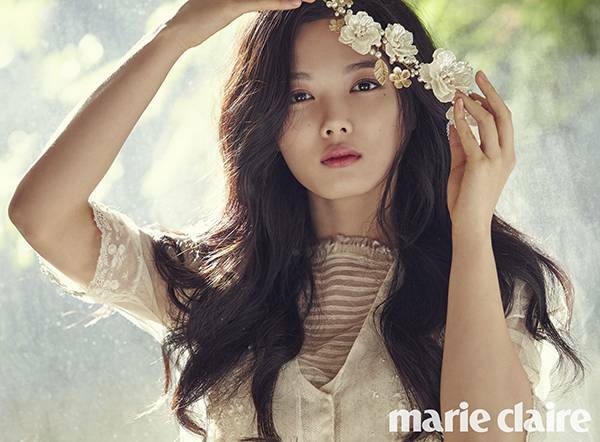 Kim Yoo Jung looks stunning in her latest solo pictorial for ‘Marie Claire‘.